Ziva is a lovely 9-month-old Standard Poodle pup in for a Lap Spay (Laparoscopic ovariectomy). 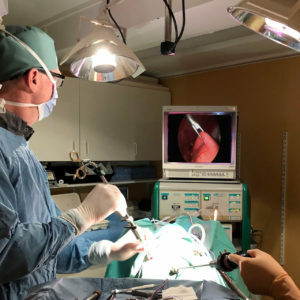 While she is here, her owners decided to have an additional procedure called a “Lap Assisted Gastropexy” done to prevent Ziva from developing a life-threatening condition called GDV (Gastric Dilation and Volvulus) later in life. GDV or Gastric Dilation and Volvulus – aka ‘Bloat’ or Twisted Stomach – happens when a dog’s stomach fills with gas/food/fluid and twists on itself. The twisting action means fluid and gas are trapped in the stomach and it expands dramatically (these dogs will literally look like the swallowed a basketball!) It is a life-threatening condition and if surgery is not done immediately, the built-up pressure will cause irreversible damage to the stomach wall and spleen. Large ‘deep chested’ dogs like Standard Poodles and Great Danes are at a higher risk of developing GDV but a prophylactic gastropexy can prevent it. A Gastropexy permanently attaches the outer surface of the stomach to the body wall so that the stomach can never rotate out of place. Traditionally, doing the procedure required quite a large incision to be made but using a “Lap Assisted” technique (such as we did for Ziva) is much less invasive and allows for a smaller incision. Most people choosing to have a prophylactic Gastropexy done for their large breed, deep chested dog will do so at the time of their spay or neuter. Please feel free to give us a call at 705-759-8888 with any questions or concerns.